Canoes, kayaks, and the even newer paddle boards, give you a freedom to move through and explore West Yellowstone’s lakes and rivers that’s unmatched by rafts and drift boats. Join us on our exclusive training lake for a kayak clinic. Geared towards families and first timers, we’ll have you paddling in no time. Half and full day private lessons. Fun & inexpensive 1/2-day guided sea kayak tours with top-notch instructors, departs 3x daily (6:30 & 9:30am & 2:30pm) for all ages. 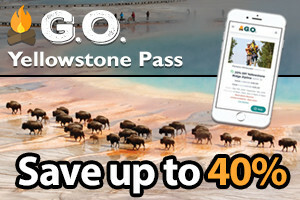 Explore geysers along Yellowstone Lake. Celebrating 40 years, the originators of raft trips down the Yellowstone River in Gardiner. 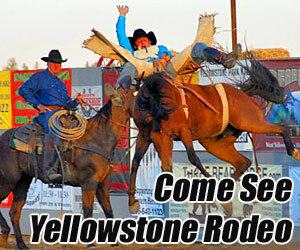 Choose scenic, whitewater, kayaking, paddle/saddle horseback and Cowboy Cookouts. On Hebgen Lake's north shore, our full-service marina offers fuel, retail stores, and rentals of single and double kayaks. Life vests and other accessories also available. While staying in our cabins, kids love our private dock on Cliff Lake enabling fishing, boating, kayak & canoe rentals, and biking local trails. Enjoy the tranquility of paddling your own SUP, canoe or kayak on Hebgen Lake. Or, take a rental fishing boat to coves where 20+" rainbow and brown trout hang out. 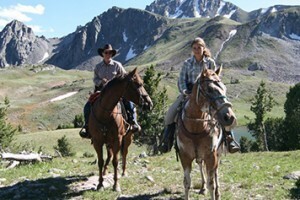 Enjoy a leisurely horseback ride near West Yellowstone. 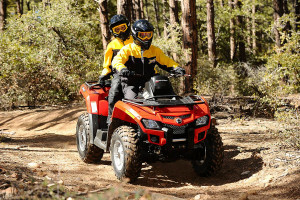 Your choice: morning or mid-day 1/2-day trail rides, or a 2-hour evening ride. Try us after your water sports. 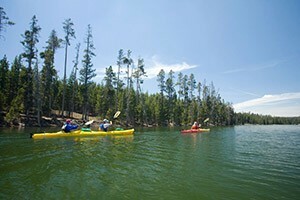 There are many options for kayaking and canoeing just outside West Yellowstone, with everything from big waves and rapids to tranquil mountain lakes. Anglers and fishermen can use canoes to access good fishing areas in Henry’s Lake and the Island Park Reservoir. Guides can provide instruction on canoeing and kayaking, help you run big rivers and take on overnight trips. A number of local businesses provide boat rentals. Rafting is never a bad option in West Yellowstone, but for a true sense of independence and the ability to explore every small nook and cranny of lake or river that may interest you, hit the water in a canoe or a kayak. Open-aired, canoes are harder to take through large rapids but are perfect for floating down flat, calm water and paddling across lakes. Canoes are easier to fish from than kayaks, as well. Smaller and even more maneuverable than canoes, traditional kayaks have closed tops and skirts, which seal the top of the boat and prevent water from coming in. Anyone who’s watched a kayak bob and weave its way through rapids (maybe even flipping over and popping back upright) can understand the excitement of taking on a river with nothing but your paddle and small boat. 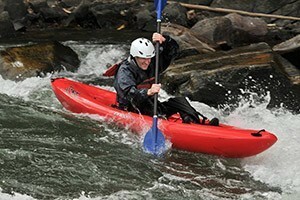 Another option that has seen increased popularity in the recent years is the open-air, inflatable kayak. These boats, sometimes called ‘duckies’, match kayaks in their maneuverability and stability, but without the pressure of learning how to roll or escape while upside down in the boat. Paddle boards, growing in popularity, are available for rent from local outfitters, who also offer guided touring services - a very fun and unique way to explore local lakes. 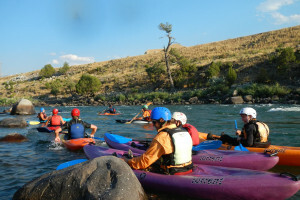 There are a number of rivers around West Yellowstone that are suitable for canoeing and/or kayaking, including the Gallatin, the Snake, the Bruneau, the Middle and Main Forks, the Henry’s Fork, Henry’s Lake, Hebgen Lake and Island Park Reservoir. The best way to find a river and trip that match your time limits and experience is to check with a local shop or guide service for the latest river and weather conditions. While some rivers have sections that are easy and calm, many of the surrounding rivers have large, challenging rapids, as well, and shouldn’t be attempted without boating experience or a professional guide. 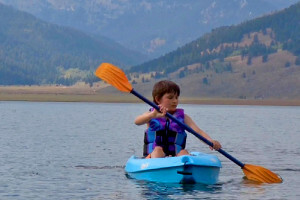 Local lakes, like Henry’s Lake, Hebgen Lake and the Island Park Reservoir are great places to go to enjoy a day paddling and fishing, become familiar with a boat or practice rolling your kayak. If you’re new to kayaking or canoeing, there are many local options for kayak and canoe instruction, ranging from quick classes to multi-day learning adventures. Since river conditions change both seasonally and from week to week as flow rates and rapids fluctuate, hiring a guide is never a bad idea. In addition to up-to-date river conditions, guides help ensure that you have all the right permits, all the gear you need, and often take care of any shuttling that may need to occur. Local businesses offer everything from half-day scenic paddling trips to multi-day, supported whitewater trips. 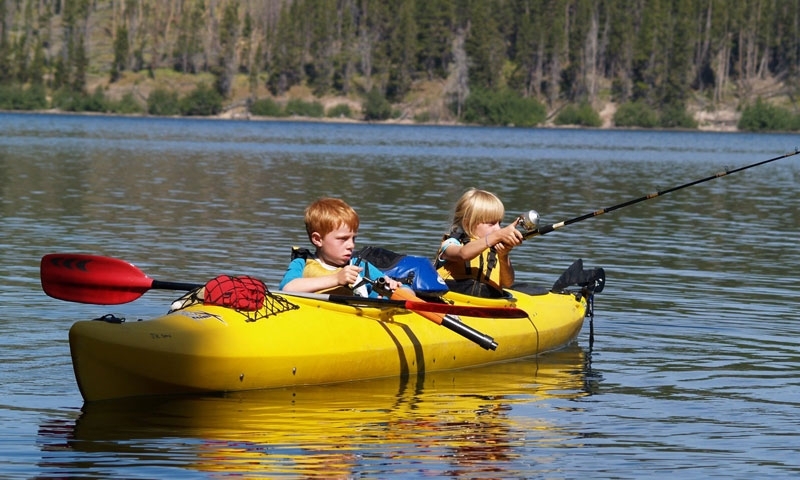 If you don’t own your own kayak, canoe or paddle board, or if travelling with a large boat doesn’t sound fun, West Yellowstone has plenty of rental options. Learn about river conservation throughout Montana.